Dev Patel (left) as “Arjun” and Anupam Kher as “Chef Oberoi” in director Anthony Maras’ Hotel Mumbai. Photo: Kerry Monteen/Bleecker Street. NEW YORK – Live telecast of the 2008 Mumbai terrorist attacks by members of the Pakistan-based Lashkar-e-Taiba, termed 26/11 in India, was broadcast relentlessly for three full days on national and international television. The horrific carnage, in which a total of at least 174 people died, and more than 300 more were wounded in attacks by 10 terrorists in 12 locations across the city, focused for most part on the tormentors holed up with hostages from around the world inside the Taj Mahal Palace Hotel, arguably the most iconic and popular luxury hotel in India. Police force in Mumbai managed to secure 11 of the locations overnight, but it needed the arrival of Special Forces from Delhi to root out the remaining heavily-armed terrorists in the Taj, after three days of battle. ‘Hotel Mumbai’, the debut full-length feature film of Greek-Australian-origin director Anthony Maras, with an outstanding international cast, including Dev Patel and Anupam Kher, will release in theaters in New York and Los Angeles later this week, and nationwide at the end of the month. The riveting film revisits, recreates the attack, mayhem and ordeal at the Taj over those three days in November more than a decade ago. It focuses on the fortitude and resilience of staff members and guests at the hotel who fought to stay alive against merciless Islamic terrorists on ‘jihad’, whose only mission was to kill as many people as possible; destroy a hotel which had become emblematic of India’s symbol of progress and modernity. Hotel Mumbai is undoubtedly the best foreign film ever made in India. Popular films by foreign and foreign-based Indian-origin directors, like Danny Boyle’s ‘Slumdog Millionaire’ and Mira Nair’s ‘Salaam Bombay’ showed the poverty and underbelly of the financial capital of India, but in terms of sheer production excellence, character realization and gripping story-telling, Hotel Mumbai stands head and shoulders above anything else canvassing India over the years. The film opens with the terrorists landing via a small dinghy on the shores of Mumbai, and speeding off in taxis to locations across the city, as handlers in Pakistan control their every move, direct coordinated attacks. Maras depicts some of the attacks across the rest of the city, but once the terrorists enter the confines of the majestic Taj, and embark on their mission, the action stays confined to the premises of the hotel. Maras expertly weaves in actual footage from 26/11 with his screen narrative, including TV reporting. The drama is compelling to watch. The actors, most of whom are based on real-life people, give stellar performances. The hugely talented Dev Patel, who plays the role of a young, committed Sikh waiter at the Taj, with a pregnant wife and young daughter back home, gives a standout performance, comparable to his brilliant portrayal of Saroo Brierley in ‘Lion’, which earned him a Best Supporting Actor Oscar nomination. Veteran Anupam Kher plays the role of the head chef of the Taj, Chef Hemant Oberoi, one of the heroes of the film, who, along with the character of Patel, and some other staff members of the Taj, make a decision to stay back and try help the guests at the hotel escape, as the terrorists go about systematically and ruthlessly killing people on floors of the hotel. During the actual attack, in 2008, Taj kitchen workers had stuffed baking trays under their shirts, makeshift bulletproof vests, to shield patrons from machine-gun fire. Guests lowered fellow travelers out of windows using ropes made of knotted bed sheets. Some Taj staff members led others through hidden corridors to safety outside, only to re-enter the hotel and look for more people to save. 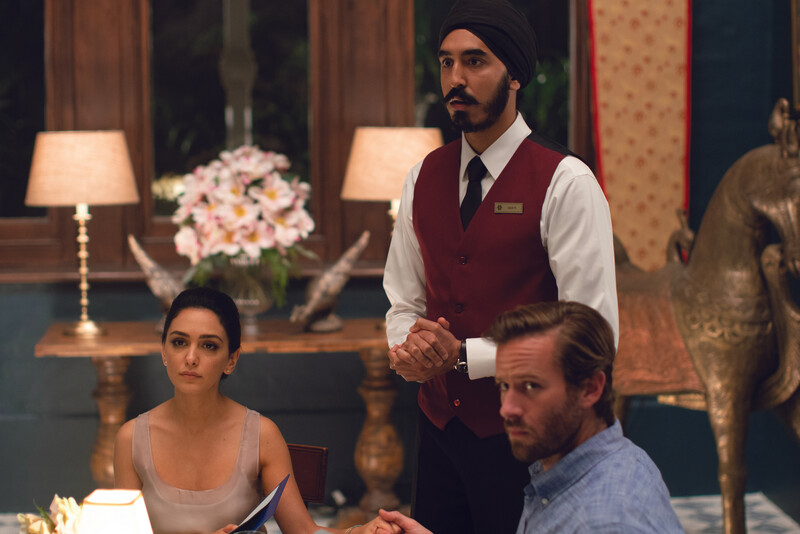 Dev Patel, Nazanin Boniadi and Armie Hammer in ‘Hotel Mumbai’. Photo: Kerry Monteen/Bleecker Street. Armie Hammer and Nazanin Boniadi play the roles of an affluent couple, who are staying with their new-born son and a nanny at the Taj. The attacks happen hours after they check into the hotel. The hapless couple soon find themselves separated from their child, forced to flee in different directions, in dire peril. The timing of the release of the film is likely to have political ramifications, in India. With the general elections scheduled to be held next month, and the ruling NDA government making national security one of their key campaigns, Hotel Mumbai if it does well at the box office, would do doubt, bolster the claim of Prime Minister Narendra Modi and his party, the BJP, that the country needs strong leadership to thwart further attacks like 26/11. Nationalistic fervor was raised by the Bollywood film ‘Uri’, and now ‘Hotel Mumbai’ comes in the aftermath of the Pulwama attack by Jaish-e-Mohammed terrorists from Pakistan, which incensed the people of India. New Zealand earlier this week pulled out ‘Hotel Mumbai’ from theaters in the aftermath of the Christchurch terrorist attacks. In India, it could well be opposition parties, who might clamor for the same. When Hotel Mumbai releases in India, the pitch against Pakistan and terrorism will rapidly rise a few more notches, as a new generation of film-goers will get to see the horrors perpetrated by India’s neighbor.